Choose from one to six heads on this high-end resaw with potential to produce up to seven boards at once. This machine easily integrates into existing systems and has a small footprint so you can maximize your space. The powered hold-down rollers ensure tight tolerances for the most precise requirements. An optional Merry-Go-Round (MGR) system can be added to automate the entire process of breaking down larger cants. Productive - saws up to seven boards in one pass using thin-kerf technology. Tough - tackles any species from frozen to kiln dried. 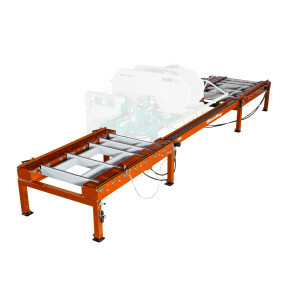 Accurate - Steel track conveyor keeps cuts accurate. Feeds almost any species for a wide variety of applications with our hydraulic driven feed rollers. 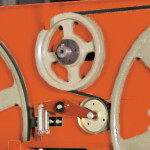 The durable hydraulic driven steel belt provides longer life and less downtime than rubber belts. Puts more power to the blade than ever before. 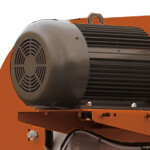 The HR1000 comes standard with pressure roller guides. Tightens blades on all heads in one place. Extra horsepower for increased production. Optional "merry-go-round" automatically feeds uncut cant portions through the HR1000, reduces labor costs, and makes true one-man operation possible.